Each year, food is provided by NRF so that hundreds of Elders and community members may share in community-wide holiday meals. There are several reasons for this service. Holidays can be stressful. Some families and caregivers feel pressure to provide gifts for their Elders. Yet many of the people we serve do not have the funds to make special purchases during the holidays. This causes stress for individuals and families. 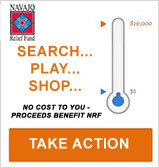 Because of NRF, people are able to enjoy the holiday cheer and save money for other needs. so a NRF "feast in a box" is a welcome treat. The atmosphere at community meals is festive, fun, and full of fellowship. Sometimes, isolated Elders have a chance to visit with other community members and share in a holiday meal. Sometimes it is the only meal they share with family. Community meals bring the community together and help us achieve our mission. Preparing a holiday meal for hundreds takes a lot of volunteers, a lot of coordination by the Program Partner, and a heart full of work. Group events encourage group participation. The more community members know one another, the more likely they are to help each other. People need food. 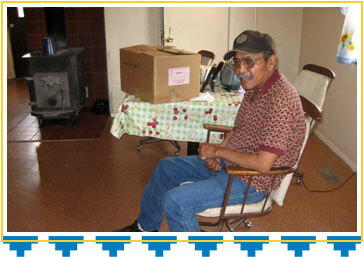 Providing food for holiday meals is another way for us to help feed the Americans living in reservation communities. For some partners, NRF is the only resource to support their holiday projects.